September 7th, 1996: Bruce Seldon vs. Mike Tyson at the MGM, the arena is full. Thousands of faces, each waiting to watch Mike Tyson destroy another man. Tupac sits among the thousands of people at the Seldon vs. Tyson fight. Tupac feels calm. He loves Tyson, and he wants to watch a man get destroyed. He wants to experience victory. Suge Knight is sitting next to him – his best friend, his boss, the owner of Death Row Records. As Tupac looks around, he thinks that he has never felt like one of them. He has always felt, deep in his chest, that his life was an emergency, that he could never quit for even one second. Everyone around him lived in mimicry, and this mimicry killed him. He didn’t want to pantomime his life. He didn’t know if it was it because he knew he would die, or because of his fatalism that he felt this. Mike Tyson entered the ring. Tupac slapped Suge’s knee, Suge smiled at him. Seldon entered the ring. Tupac yelled, “Seldon looks scared.” Suge saw the fear in Seldon’s eyes. Suge knew fear, he knew exactly what fear smelled like. He could see Tyson was focused, that Tyson had a hold over himself, he was in control. Tupac liked the idea of the fight, the idea of the world seeing how hard these two black men worked, that their bodies were beautiful, that no one alive could stand in a ring with these men. 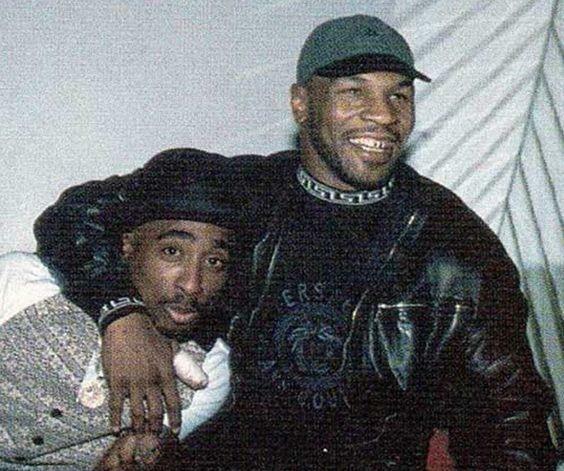 When Tupac looked at Mike Tyson, he saw himself – another man, trying to innovate, change the world. Another man that had come from sadness. Tupac knew and felt why Tyson could escape into such rages. They were two black men who had risen to the national spotlight. For them, it was not just a fight to be the best in their disciplines, it was war, a massive force that wanted to smash the history of their country. America was one thing, but America was Tupac and Tyson, too. From the sailboats of Bar Harbor, Maine, to the cornfields of Iowa, the abandoned mills of Ohio and Michigan, Santa Monica Pier and the Stratosphere, the rights of Thomas Paine, Benjamin Franklin, four wheelers, ice cream trucks, taco stands – all of it was Tupac and Tyson. They were always America, they were treated like a spectra, but it was theirs. Tyson stepped back and thought, “Of a most stormy life.” He didn’t feel anything. He didn’t even know why he won. There was a part of Tyson that wished he would be punched to death, that someone could kill him, and end the sadness in his heart. Tupac and Suge left their seats and went to the back area to congratulate Tyson. Tupac felt crazy with excitement. His body surged with energy. But, like Kurt Cobain, there was too much energy, and it made the people around him uncomfortable. Tupac couldn’t help it. He demanded reality be lifted. He loved losing himself in those moments, because he knew that when the thrill wore off, when the surge receded, a darkness would come, a torrent of pain, of memories, a surplus of moments where he felt uncomfortable, unwanted, like excess. Tupac and Suge entered the casino area, slot and poker machines everywhere, old people from all over the world sitting, smoking cigarettes, drinking watered-down rum and cokes. Tupac liked Vegas. The lights, the sound of change falling onto metal, felt like ocean waves to him. He felt euphoric walking through the casino, then someone came over and whispered something into his ear. Tupac and Suge got into Suge’s car. Suge was driving. Tupac had already forgotten about the fight. He’d just forgot it ever happened, as if he was designed by Nietzsche himself. He was the Super Man. A fearless one that had emerged out of a scared society that could no longer stand up for itself. Aristotle said, “Such a one may truly be deemed a God among men.” And Aristotle also noted that civilizations often killed those who rose too high, who have no concern for the laws of men. Suge and Tupac stopped at the red light at the intersection of Flamingo and Koval. To the right of them was a car full of girls, and they asked Tupac and Suge where they were going. They both yelled back, “To a club.” Suge and Tupac were really happy, they felt in the moment, they weren’t scared or lonely. They weren’t old and sick, preparing to die. (The author doesn’t know if Tupac truly hated that cop after watching the cop pull guns on his friend, but if someone pulled a gun on your friend, would you feel respectful to that person? Maybe it is the question. A man is dying, and instead of asking “Hi, my name is Jim, Are you okay?” You ask a stupid question that could be answered later. Or maybe Tupac could never be a snitch, and the cop did not and would never understand true honor in Tupac’s opinion, and Tupac had no respect for those who lacked honor). Noah Cicero lives in Las Vegas, NV. He has several books published, including Bipolar Cowboy and The Collected Works of Noah Cicero Vol. I. He has several books in translation in Chile, Argentina and Turkey. He likes to hike trials around Las Vegas and likes cats, and raccoons.